GerbilMechs.com - Nanotechnology for the People! 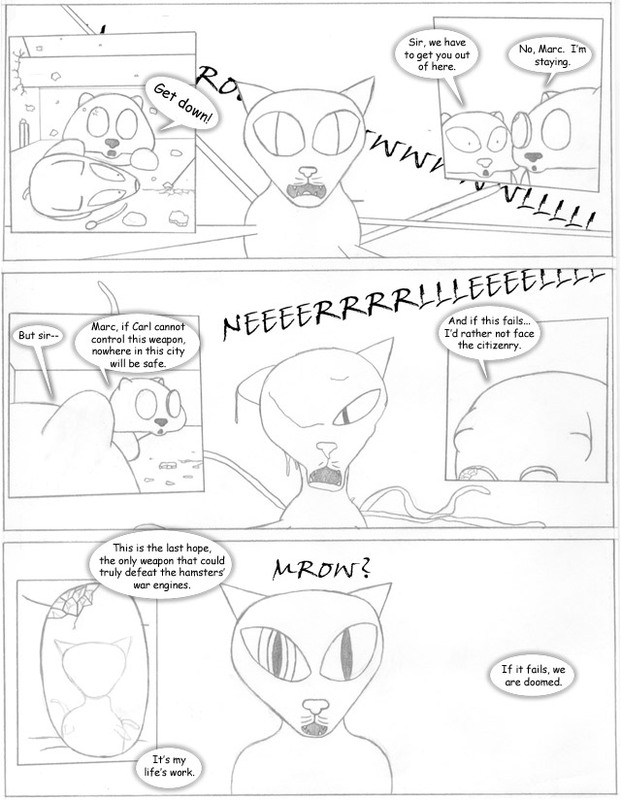 20Jul2004 (Monthenor): This week is mostly my attempt to draw a cat three times in a row. Melty cat. Melty cat! And I threw in an interesting insight into the Doctor's character because I'm a nice guy. Cubivore: This game is a head trip. Wow. It is a game about evolution and hunting, evoking memories of E.V.O. This ain't your daddy's EVO, though. The most striking feature of the game is that everything is a rectangular solid. Perhaps because it was originally planned for the venerable N64, perhaps because the developers smoke crack in their spare time, the game follows this design aesthetic to its illogical conclusion. Square animal heads hop, slither, and fly across a cubed landscape, attempting to rip rectangular pieces of meat from each other's hides. Walking through water causes square ripples. The sun is a cube with a red circle painted on each side! In this bizarre environment, we put the animals. Each animal is a cubic head with 1d6 pieces of meat attached. There are five colors of meat, with Pale, Dark, and Shiny (Rage) variations of each. Now comes the genius. Eating a set of meat mutates you into a new creature. This is easier to explain through example: let's say I'm a three-legged pig. Stop laughing. I manage to eat three pieces of Pale Yellow meat, turning me into something squat and waddly with high defense. I then chase down and eat something with Dark Yellow meat, adding some lovely tiger stripes to one of my meats and mutating me into a stronger waddling form. I then get two more Dark Yellow pieces, changing me yet again. Eating three Shiny Yellows would create a super-powerful little waddling menace. If you want to tear your hair out, you can even try filling out your "Clash" mutations by eating specific combinations of differently-colored Shiny meat. More importantly, each color actually performs differently, and I used them all at some point in the game. Yellow is a color of short, penguin-looking setups that are high on defense and hit points but very slow. Blue creates long snakes that can pounce on opponents from a very long distance. Red bird things have the highest Jump rating and float down slowly. Purple...purple makes squid things that like to walk backwards, and some of the more powerful forms even have their head on backwards to encourage this. Grey is the all-purpose beatdown color, with high attack and speed ratings. They also look like wolves and lions, so they're easy to understand and control. That's all just the mechanics of the game. Standard gotta-catch-em-all fare dressed up with color management strategies. This already respectable core is coated in a layer of humor that, while aimed at little kids, I must salute for its seemingly endless variety. Already I mentioned that the sun is a cube. The moon is, too, and the game tracks a simple day-night cycle in each level. If you're still around when night is over, your animal sighs and goes to sleep (with a unique "settling to bed" animation for each form, natch). As he snores away, you are treated to a limerick about the level you're in. Usually it mentions how badass the boss creature is. When you beat the boss and take his special meat, you are then allowed to enter the Mating Grounds and mate with a female to create a new beast with one more limb than you currently have. The game helpfully communicates this fact by having your animal shout "I can mate! I can mate!" every time this happens. The actual mating is extremely tame by all but Orthodox Jew standards. Your animal enters the level's Tunnel O' Love and ends up in a vast pink formless void. You attract a number of females based on how many mutations you've collected over the game -- by the end, I was getting 21 every time. Yeah baby. You then run offscreen, trailed by the females, and the game tells you the results in a very dry manner. "You mated with 21 females." This takes exactly as long as mating with 2 females. "13 of the 21 females had babies." You can then pick the new form you want to take out into the world. Back on the normal map, your larval offspring crawls away from the head-corpse of your old form, growing within seconds to full size. After each level you get to see a little diary entry from your creature. It recaps what just happened, from his perspective, and adds color commentary. Through this humorous glimpse into your animal's psyche, you watch as the madness of the Call of the Wild slowly turns him into a ravenous maniac. I'm not kidding. Your creature starts out gentle and polite and ends up writing AAAAACK! all over the place and gibbering about eating meat. It's damned creepy, but funny at the same time. More importantly, I never ever saw it repeat itself, even when I went back and beat old levels over again. It must be tied to the total number of mutations rather than the level, but the sheer genius required to write so many different diary entries staggers me. I don't know if I recommend a buy on this one, or even if I know where you could buy it, but everybody with a GameCube should set aside a few days to rent this game. It is aggressively, uncompromisingly unique and one hell of a game. Wow. I typed a lot. I should leave I, Robot for Morgion, or Friday. Whichever gets here first.